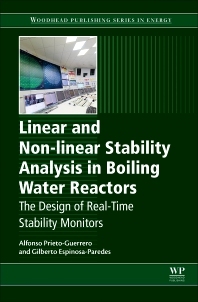 Linear and Non-Linear Stability Analysis in Boiling Water Reactors: The Design of Real-Time Stability Monitors presents a thorough analysis of the most innovative BWR reactors and stability phenomena in one accessible resource. The book presents a summary of existing literature on BWRs to give early career engineers and researchers a solid background in the field, as well as the latest research on stability phenomena (propagation phenomena in BWRs), nuclear power monitors, and advanced computer systems used to for the prediction of stability. It also emphasizes the importance of BWR technology and embedded neutron monitoring systems (APRMs and LPRMs), and introduces non-linear stability parameters that can be used for the onset detection of instabilities in BWRs. Additionally, the book details the scope, advantages, and disadvantages of multiple advanced linear and non linear signal processing methods, and includes analytical case studies of existing plants. This combination makes Linear and Non-Linear Stability Analysis in Boiling Water Reactors a valuable resource for nuclear engineering students focusing on linear and non-linear analysis, as well as for those working and researching in a nuclear power capacity looking to implement stability methods and estimate decay ratios using non-linear techniques.